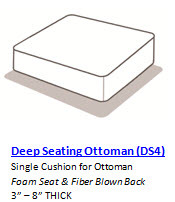 Replacement or custom cushions can transform your living experience by providing renewed comfort, an updated style to fit your decor and lasting performance. Indoor or outdoor furniture are a stylish investment in comfort, and you shouldn't have to throw out the entire furniture piece because your cushions have gone flat or because the fabric is no longer trendy. 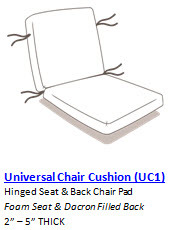 Instead, you can easily get custom-made replacement cushions. 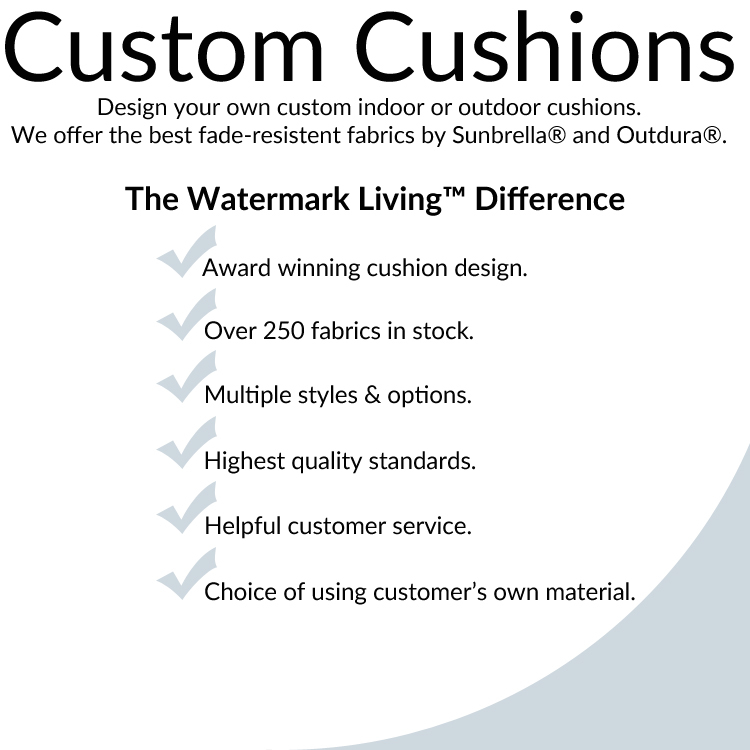 With the Watermark Living™ P-FIT Program we offer a one stop shop for all cushion needs. 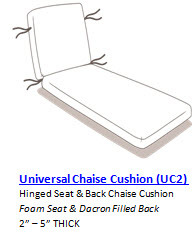 We strive to provide quality custom and replacement cushions for most sized furniture. 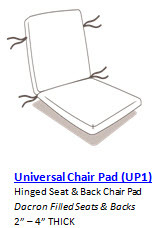 **NOTE: When ordering from the Watermark Living™ P-Fit Program note that we DO NOT offer returns. Please make sure you provide us with accurate and as much information as possible. If you have any questions, we are here to help. CONTACT US. 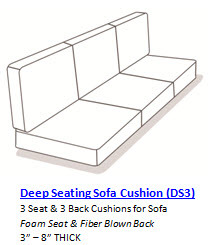 1) Measure the width - this is the area between the arms, on the seat of the chair. 2) Measure the height - this is from the back of the seat all the way to the top of the frame. 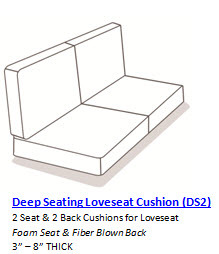 3) Measure the depth - measure from the front edge of the seat all the way to the back of the seat. 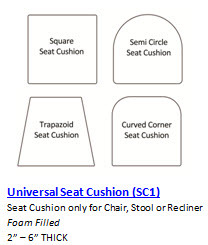 4) Measure the thickness - this is from the top to bottom of cushion (do not compress). 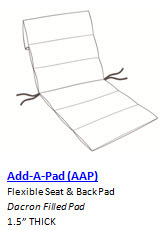 1) Measure the width - this is the area between the arms on the seat of the chair. 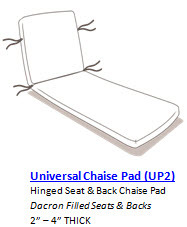 - Make sure to pay close attention to the piece being a back cushion that sits atop a seat cushion. This will require some subtracted measurements. - Make sure to pay close attention if the piece is curved or not. This will affect the measurements. 3) Measure the depth - this is from the front edge of the seat all the way to the back of the seat. 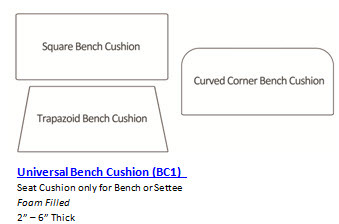 If you have furniture with odd curves or difficult to measure angles please CONTACT US and we will assist you in finding a solution. Watermark Living™ wants this process to be as user friendly and easy as possible. 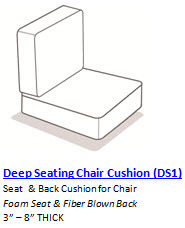 Click on the image below to order your custom cushion, made just how you like it!